Before his death, Paul the Oracle Octopus was the most famous resident of the Sea Life Aquarium in Oberhausen, Germany. Paul was just another cephalopod until he began correctly picking World Cup games. Then Paul the octopus became Psychic Paul the World-Cup Predicting Octopus and his fame began. Paul picked all eight of Germany’s World Cup games correctly, then picked the final game properly. Paul may be dead, but his memory will live on. 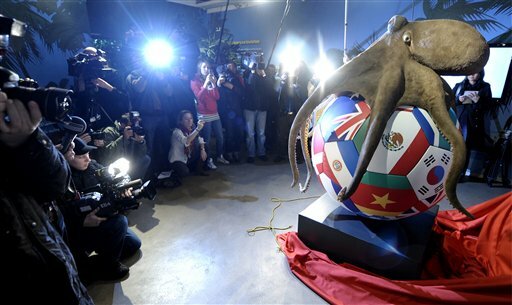 Paul the Octopus has been given a 2-meter-tall (six and a half feet US) statue in his memory. Sea Life spokesperson Tanja Munzig says that the Paul statue contains the remains of the actual Paul the Octopus, with the gold-leaf-decorated urn containing his ashes finding a resting place inside the soccer ball base of the statue. The statue depicts Paul with his eight limbs wrapped around a World Cup ball. Since Paul the Octopus died 3 months ago, fans around the world have been asking for a proper memorial, and this fits the bill.